This bar stool is not only impeccably fashion-forward, but it features a handy adjustable height function to guarantee perfect, ergonomic comfort for everyone. The industrial look with swivel corkscrew mechanism looks totally urban chic with a wire-brushed, distressed wood finish and metal legs in a slate grey color. Bar stool height is adjustable from 25" to 30". The 10181 Industrial Bar Bar with Swivel Adjustable Height Mechanism by Coaster at AHFA in the area. Product availability may vary. Contact us for the most current availability on this product. Inspired by the design of antique drafting stools, this pub dining set has an unforgettable industrial feel that's the perfect fit for an urban, country cottage, or steampunk room decor. The corkscrew-style swivel base allows you to adjust the height of the bar stools and table, so its incredibly easy to find whatever seat height is comfortable for you. 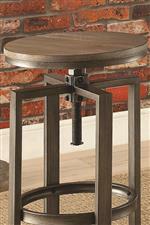 The 10181 collection is a great option if you are looking for Industrial Contemporary furniture in the area.